On September 22, the delegation of representatives of Ukrainian NGOs, who formed a coalition for advocacy activities at the Human Dimension Implementation Meeting of OSCE, met Robert Berschinski, Deputy Assistant Secretary of State in the Bureau of Democracy, Human Rights and Labor. The former hostages of so-called Luhansk and Donetsk People’s Republics also attended the event. Robert Berschinski, photo taken by Németh Attila, the U.S. embassy in Hungary. The U.S. official and the representatives of Ukraine’s civil society discussed the following issues: the situation with the rights of internally displaced persons, human rights violations in Crimea in general and Crimean Tatars in particular, including improvements in Ukrainian legislation, etc. They paid particular attention to the actions taken by authorities to solve these problems. 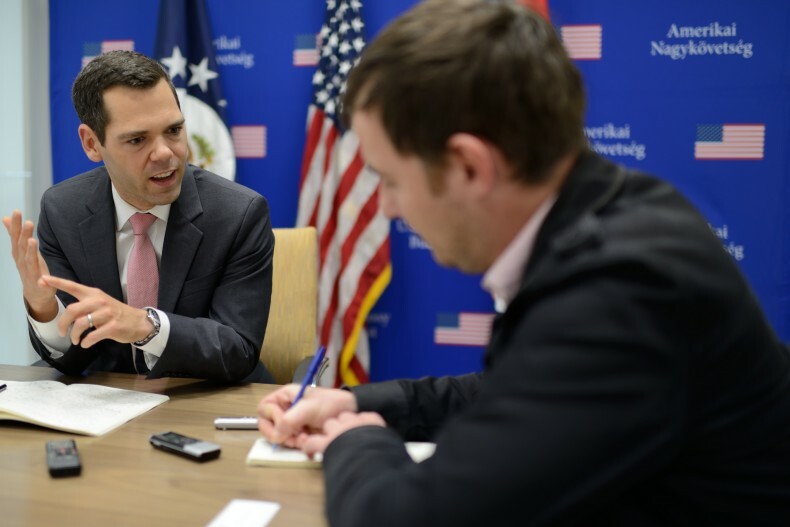 At the end of the meeting, Mr. Berschinski assured that the United States government would continue to support the actions of the Ukrainian authorities and NGOs to protect human rights and contribute to the Ukrainian question to remain high on the international agenda. He thanked UHHRU for the briefing organization.